It’s one thing to write a hit song, but getting people to hear it is another story. There are thousands of “hit-worthy” songs out there that most people never even hear. It’s unfortunate, but you can start changing that trend by taking a more proactive role in the marketing of your song. This is an active business. Chance are you won’t randomly get found and thrust into the spotlight. You need to MAKE your song a hit. You’ll have to start small, but starting at all will put you ahead of the pack. The process of songwriting is one of the best opportunities to connect with an audience. Of course, if you’re writing songs with hopes they are used by another artist, this strategy may not be useful to you. Keep in mind though that unless you have a publisher with connections on your side, your song may never get to that high profile recording artist. Try your best to get that connection, but don’t make waiting a habit. Sitting on an unreleased song forever isn’t going to get you very far. People love the process. 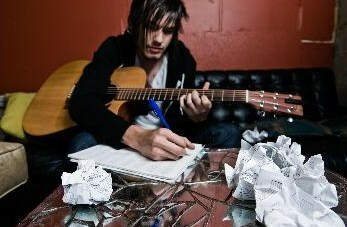 Try posting “rough-drafts” of your song on YouTube or make Vine clips for Instagram or Twitter with short lyrical sections. People love a story. I’m sure you’ve listened to lyrics and found yourself speculating about their meaning or what drove the songwriter to put those thoughts and emotions into song. Try writing blogs about the inspirations you’re feeling as you write. Stories give you the opportunity to connect with people on a level that goes beyond music. Maybe you experienced a profound event or a death. Maybe you have a passion for hiking and were inspired by that feeling of accomplishment you get at the top of a mountain. Whatever it is, people can connect with those stories. Tell yours. We want to hear it. Stories that go beyond music also allow you to shine in a much less crowded space. In the music industry you’re just another songwriter in the crowd, but in the world of hiking you can be the star. Take this concept a step further and use those stories to get coverage for your song outside the music space. Eileen Quinn draws her inspiration from sailing and, as a result, was able to get coverage from sailing magazines and blogs. These updates throughout the entire process keep you in the front of your fans minds. Songwriters can sometimes feel isolated from the rest of the music industry. Recording and touring artists have to be out there interacting with people. You don’t have to stay behind the scenes - this year, make it a goal to get out there and meet people. Remember that this is a personal business. Emails aren’t going to cut it. Call people up, invite them to your show, meet them for coffee. You don’t have to go on a full-blown tour, but try playing some smaller, singer-songwriter type gigs in more intimate environments where people can really connect with your song. Connect and collaborate with local bands. Maybe they’d be interested in covering one of your songs. Or, even better, maybe they know someone who could get your music in front of a publisher. Try to get connections to people outside the traditional music industry. YouTube personalities, bloggers, and amateur photographers are just some of the options available to you. Many people who run YouTube channels are always looking for new music to use in the background of their videos. These people are tastemakers - their following really trusts their opinion - and just having your music there is enough to get their followers to check you out. The key with everything is to start small. It takes time to get the opportunities that will really make your career. But writing a great song and just waiting for your big break won’t make a hit. Get out there, be proactive, and start taking the first steps towards the songwriting career you deserve. If you’re ready to take a more active role in your own songwriting career, check out the New Artist Model online course. Sign up for the mailing list and get access to 5 free lessons.